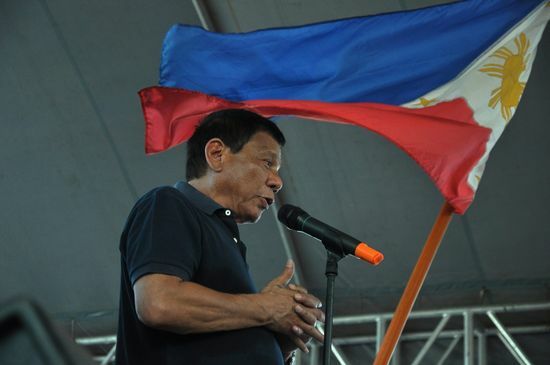 Mayor Rodrigo "Rody" Duterte will do three things for OFWs if he will win the Presidential elections. First, he will create a single government agency for Overseas Filipino Workers like you. The single agency will handle all your concerns. Second, he will create a bank for OFWs for sending money to the Philippines. The bank will be in places where many of you live or work. This plan is good for two things. You will be able to remit money faster, and you will save money and time when sending money to your loved ones. Third, he will require the Philippine consuls to keep track of the Filipinos abroad so they will be able to assist you at the first sign of abuse. You will get legal aid and hospitalization and going home will be free. That is if you help him wins. Because of the absentee voting law, your OFW ballot can affect the results of the election in the Philippines. Knowing his stand on issues close to your heart gives us a glimpse of his other plans. The issues about going and working abroad are not new. Will the plans of Duterte solve these problems? Illegal recruitment. He will create a code of conduct for recruitment agencies. A system will rank the agencies and cite those in good standing. He will work closely with local government units to enforce the code and widen sharing of the work of illegal recruiters. This article shows how OFWs can avoid illegal recruitment. High placement fee. Mayor Rody Duterte will enforce the law limiting the amount of placement fees. He will do programs to allow you to report payment of high fees. Are you a seafarer or must you attend various training courses? He will lessen your placement fees, although seafarers do not pay placement fee now. Employer abuse. He offers temporary shelters for victims of abuse. OFWs will get their own health care program especially for those with serious illnesses. He will set up help desks in Philippine embassies and ports of entries and exits to give quick support. Corruption at the airports. Rody Duterte will make a quick response system at the airports to provide legal aid and guide passengers. He plans to increase security measures and create a task force to look into the illicit activities in the airports. He will retire those involved in the laglag bala scheme. Balikbayan boxes. He will enforce the law which exempts non-commercial balikbayan boxes worth $2,000 and below from taxes. Measures will be in place to prevent abuse of this privilege and check the true contents and value of boxes. Most of these plans and measures are not new. What matters is that the Mayor has a knack to get things done as his biography is an open book. Your OFW absentee voting ballots will decide whether Rodrigo "Rody" Duterte is the right person for the job. Will you vote for him for President?